Went up to mother-in-laws over weekend. Was going to take yaks n do some fishing. Didn’t happen took rifle instead. Got the ok to go up the hill block on the farm property that in-laws rent a house on. Got the spiel on the” mad neighbour who will call the cops if they think you’re going to shoot there goats so be discreet..”. Background here neighbours have milking goats which roam and mingle with the feral goats that are on the property. Dragged the middle boy from his iPad and headed off. Up the hill track a wee bit I hear “it’s hot, can I go back, my backs sore...” “Well what did you expect when I said go for a hunt/walk up the hill..?? We’ll carry on a bit more..” A bit further another stop. “You thirsty?” “Yep” “Well get a drink from that creek down there, that water will be sweet as..”. Boy goes n gets a drink. “Use your hat as a cup if you have too..”. Replenished we carry on. Come up a brow I spot a couple turkeys. I take a couple steps back and motion my boy up. “You wanna have a shot at them..? Yes he does. Sneak up a bit, line up behind the rifle and takes the shot. Whack bird down. “Have a go at the other one” Reloads sights up “whack” not quite a kill shot but it’s going nowhere. Go down across a small creek to get to the birds. The second is moving a bit so I go to finish it off and ..miss.. shoot again..miss..shoot again hit it in the neck n it flaps like buggery n flaps n rolls down into the creek. Retrieve the bird n do the obligatory “trophy” photo n whip the breast meat out. No good for eating, cats will appreciate it though. Carry on with the boy carrying the rifle n me the meat..I guide rangi him from behind telling where we want to end up. We head up to the top of the hill to take in the view. Spot a goat stuck in some netting so let it go. Watched a mob of goats for a while feeding there way up the hill. See a billy in another mob that seems to have quite spread. It gives us the slip but have my eye on him for another time. Spot a hare and have a few shots at it...miss miss miss. Fire a couple of shots into a dirt pan to work out where they are going n to estimate holdover. That done so spot a rabbit..whack flop. Go in pick it up..straight in the ear hole. Go to head back to car a different route we spot some goats. Sneak up a bit closer and set the boy up for a shot. 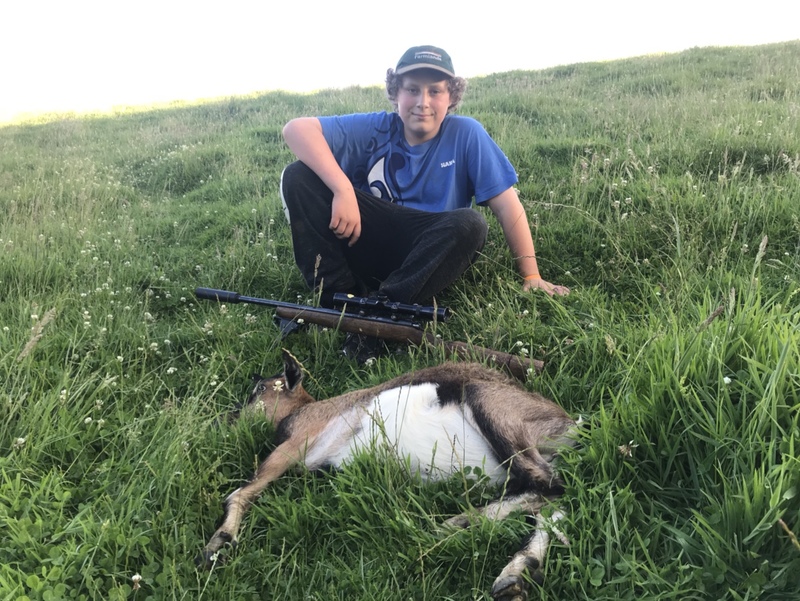 “Aim back of head/neck...” “Yeah ok dad” He takes the shot...hmm not a killing shot “You hit it ...?” “Pretty sure Dad” “Ok we’ll have to wait” couldn’t ID the goat cos the colouring was all the same.. The mob heads off with one lagging behind.. pretty sure that’s it. I line up and take the shot. ‘Whack’ drop it clean. Boy goes back to get the meat, I go to check the goat out. Smacked it in the back of the head and spot some blood where a back steak would be. Take the back wheels off and head back to car. On the way back spot two rabbits, get them both with headshots. Sweet. Well done 'Packhorse' its never too early to get those boys out on the hill. A variety of game there, some good eating. Is the mad neighbours name Tait or Tate? Russian 22. wrote: Is the mad neighbours name Tait or Tate? Was the place near Hamilton? Cos it looks familiar. The whole mad neighbour who wants to round up the ferals and discrete hunting getting you a decent feed. Just as I follow up I went back up to the block to take my girl for a look at some horses. Shot a rabbit on the way up and put a stalk in on a billy that I thought had a reasonable head. Didn’t get good look at it then it had gone into the neighbours. Gained some knowledge though of how the goats run at certain times of the day and possible ‘ambush’ sites... A good morning. I wouldn’t call it near Hamilton but certainly in the greater Waikato region. Packhorse wrote: [quote="Russian 22. "]Is the mad neighbours name Tait or Tate? Sent from my iPhone using Tapatalk[/quote]I know where it is then hahahaha. The farmer is certainly mad alright. Talks about rounding up the 200 odd goats and sheep with huge coats and dags etc. But sad really.